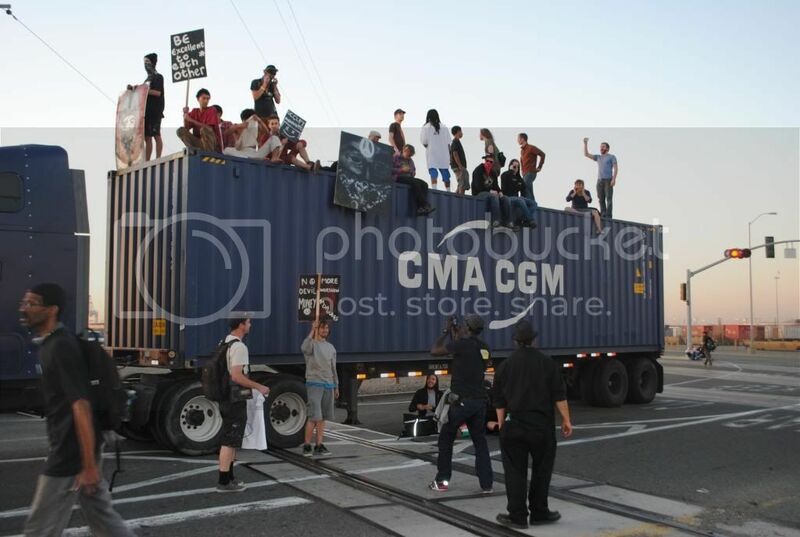 Protesters at Port of Oakland, Nov. 2. Dec. 11, 2011 | When you sort through the subterfuge and flagrant corporate lines peddled by the local mainstream media over the possibility of a rift between labor and the Occupy Oakland movement, a very interesting narrative emerges. The San Francisco Chronicle, Bay Area News Group and all the local television stations have framed the Dec. 12 West Coast Port Shutdown centered in Oakland as an attempt by the Occupy Oakland movement to undercut the economic interests of regular residents. In the meantime, business reporter Andrew Ross (Again, of the Chronicle) trumpeted the perception of a disconnect between labor leaders and the movement. Josh Richman of the Bay Area News Group chimed Friday with the same basic story of a rift with another labor union. Incidentally, both article used the loaded term of “blockade” in their titles to describe the shut down, which might give an indication of the paper’s stance on the subject. Is there or isn’t there a conflict between union brass and the rag-tag, but highly effective Occupy Oakland movement? An article in Salon Friday illustrates where the rift is emanating and it’s not where your local underpaid journalist says it is. Emily Loft says the ideals of the Occupy movement is applying pressure to the higher-ups at labor unions who in terms of organizing are that group’s one percent. For years, members of certain — not all — unions say their bosses have compromised their collective power in back-door agreements and concessions. Some resent the “team concept,” a labor term for the working relationship between union bosses and CEOs, which places efficiency and profits over workers’ needs, according to disgruntled members. There is similar sentiment regarding the unions’ long-standing relationship with the Democratic Party — an institution also married to big business. Just like many occupiers are ambivalent towards President Obama’s re-election next year, there is a similar expression of disillusionment with the entire Democratic Party. The perception is the political party is generally in cahoots with big business and merely the other sides of the same coin when it comes to the Republican Party’s same approach to business as usual. Is the rank-and-file in support of the port shutdown in defiance of their labor leaders as the Salon article posits? My experience says yes and a variance in opinion usually correlates with how close your personal relationship is with top labor brass. Another longshoreman told me Wednesday that members support the shutdown in general terms. Namely, the International Longshoreman and Warehouse Union (ILWU) will never cross a picket line, no matter what, he said. Conversely, the union did not appreciate the Occupy movement taking the reins of what they believe is, at its core, a labor dispute with gargantuan grain exporter EGT, who is muscling out ILWU’s workers in Washington state. “We have a democratic process that we go through in our union,” he said referring to sanctions such work actions. If the point of contention between the Occupy Oakland and labor unions is merely an exercise in semantics then why did three Bay Area frame it as a device to conquer and divide the 99 percent? Who knows? I would say it’s because they don’t serve your interests, but somebody far more powerful. A better meme to carry from the West Coast shutdown is no matter if you are on the right side of the Occupy movement, abuse of extreme power will be targeted whether you’re a CEO of a major corporation or the pampered, disaffected union boss. Posted in general strike, ILWU, labor, occupy wall street, occupyoakland, protests, San Francisco Chronicle, unions. Bookmark the permalink.